I'm doing our regular walk to the post office when I spot a white tent on the green grassy bit opposite the school on Launcelot Road and my instant thought was oh no - a police tent! Given that in the past 3 weeks there was a 16 year old stabbed to death followed a week later by a knock on our door to see if we had witnessed anything after someone tried to break into our neighbours house with a shovel, I think that's a justified reaction! However - this wasn't a police tent at all - it was something lovely for a change! 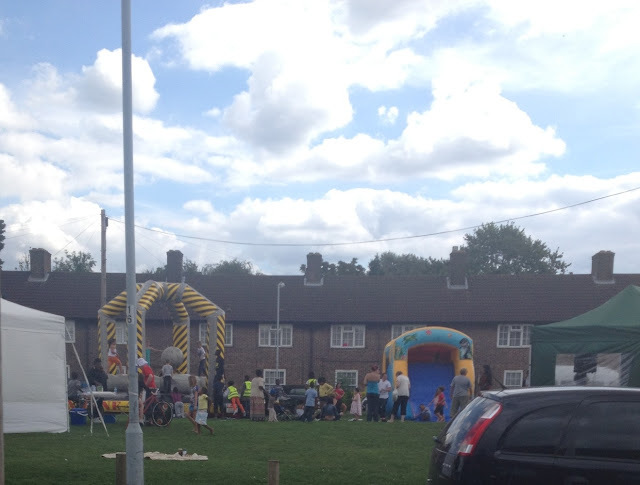 The local youth project had put on a fun afternoon for the local residents of Launcelot Road, Bromley (br1) Downham border. The white tent was a make your own smoothie bar - where you power the blender by cycling! There was also a marquee for karaoke - not one for me, I'm only allowed (or should that be aloud!) to sing in church - I'm banned from any other singing! And another inflatable that I've not seen before with a massive planet to dodge while people pushed it at you!